Texas is the second-biggest water polluter in the country, in terms of pounds released. But when the toxicity of the pollution is factored in, Texas jumps to the top of the list — and it’s not even close. Editor's note: This story has been updated throughout to include a response from Pilgrim's Pride and the TCEQ. Texas is the second-biggest water polluter in the country, in terms of pounds released, according a new report. But when the toxicity of the pollution is factored in, Texas jumps to the top of the list — and it’s not even close. Texas polluters released about 16.5 million pounds of toxic chemicals into waterways in 2012, second only to Indiana, according to a report released Thursday by Environment Texas, an environmental advocacy group based in Austin. And in terms of a measurement that compares pollutants according to how toxic they are, Texas is without rival. According to the report, Texas produced 34 million “toxicity-weighted pounds” in 2012 — 30 times more than the next state, and more than double the rest of the country combined. Almost all of that toxicity comes from one source: the Dow Chemical Company plant in Freeport. Terry Clawson, spokesman for the Texas Commission on Environmental Quality, said in an email that using such toxic release data to "infer negative impacts on health and the environment is grossly misleading." The agency has "robust water quality permitting and enforcement programs," he added. "Texas is the second largest state in the country and has a growing industrial base with 677 permitted industrial dischargers," he said. "Any comparisons with other states would need to factor in these significant differences." The report is based on data self-reported by polluters to the Environmental Protection Agency. The EPA only requires this information from certain industrial facilities, which leaves out other sources of toxic pollution, including oil and gas drilling, the report notes. The Dow plant wasn't among the top 50 facilities in 2012 in terms of total pollution. But its chemical runoff, which flows into the Brazos river and the Gulf of Mexico, included 3 pounds of dioxin, an extremely toxic chemical that can cause reproductive and developmental problems, immune system damage and cancer. According to the EPA's guidelines, that's equivalent to 33.4 million toxicity-weighted pounds. A Dow spokeswoman acknowledged that the facility had released 3 pounds of dioxin, but disputed the EPA's toxicity measurement. "Our water emissions are closely monitored and reported and we are in compliance with all state and federal permits," the spokeswoman, Trish Thompson, said in an email. According to the EPA's website, the Freeport plant was noncompliant for 12 consecutive quarters ending in 2013, the most recent year for which data are available. The top overall water polluter in Texas was the Pilgrim’s Pride chicken-processing plant in Mount Pleasant, which in 2012 dumped 2.8 million pounds of toxic chemicals into the Tankersley River in Northeast Texas, the report says. Most of those toxins were nitrates, chemicals found in fertilizer that can cause infant health problems and oxygen-depleted “dead zones” in waterways. Pilgrim's Pride spokesman Cameron Bruett said the plant is in compliance with legal limits on discharges into water. In the event of exceeding those limits, "Pilgrim's works with local officials and regulators to immediately resolve the issue," he said in an email. He added that the plant is scheduled to complete a wastewater treatment improvement project by the end of the year. 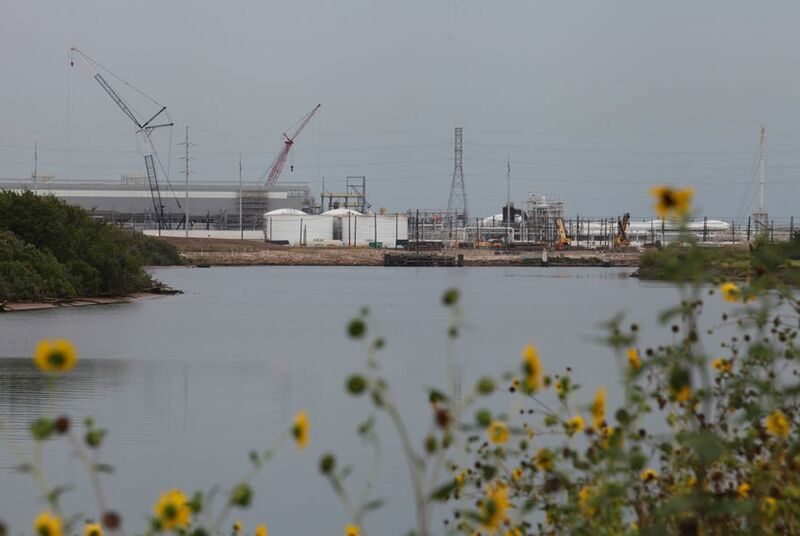 Luke Metzger, director of Environment Texas, said the case of Pilgrim’s Pride shows that Texas water pollution is a statewide issue not limited to the chemical plants on the coast. “There are still millions of pounds of very dangerous chemicals going into our waterways which could put human health and the environment at risk," he said. The report recommends that the federal government approve rules proposed earlier this year by the EPA and the U.S. Army Corps of Engineers that would extend Clean Water Act coverage to more small waterways. It also calls for stricter enforcement of existing regulations. According to Rumpler, lax state enforcement is a major reason for Texas’ poor water pollution record. The TCEQ, which is responsible for enforcing environmental regulations in the state, "has not done its job in terms of either enforcing limits on pollution, or attaching stringent enough pollution limits in the first place to ensure that Texas rivers are clean," Rumpler said. Clawson said the TCEQ has robust water quality permitting and enforcement programs. "The TCEQ routinely monitors and requires monitoring for levels of the pollutants in the water to ensure they don’t exceed the permitted limits," he said. "If TCEQ documents permit exceedances, enforcement action is taken."